You’ve probably heard musicians or audio engineers talk about using a DI or direct injection box onstage or in the studio. Even if you’re familiar with the term “DI,” you may be unsure about what this device actually does and when you’d want to use it. Here’s the short answer: If you play an acoustic guitar equipped with any kind of onboard pickup system, at some point you’re likely to plug it into a PA or studio console—and that’s where the DI comes in. 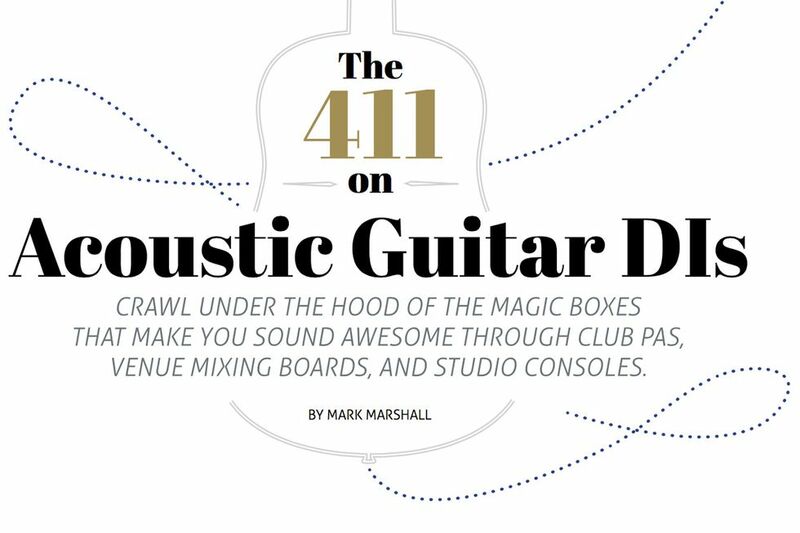 Whether you’re gigging at a local coffeehouse, performing at a major festival, or laying down songs in the studio, it pays to be familiar with DI boxes and the host of options that are available to acoustic guitarists. So let’s get right to it. Studio consoles and front-of-house mixing boards are designed to accept balanced, low-impedance (aka low-Z) signals from microphones. Most acoustic-electric guitars deliver an unbalanced, high-impedance (high-Z) output signal that’s appropriate for all guitar amps and pedals, but not pro audio gear. For a guitar signal to match the levels required by a mixing board, it needs to be converted. This is accomplished using a transformer, which is the beating heart of the DI. The simplest (and least expensive) DI boxes are passive—no battery or power supply required—and provide a 1/4" input for your guitar cord and a XLR output. The latter connects to the mixer using the same type of cable as a professional mic. Boom—now you can run your guitar into the sound system. One reason to send a high-Z guitar signal into a DI box is to ensure the guitar’s sound survives the long cable runs typically found in stage and studio setups. Here’s what’s going on: An unbalanced cable, such as a standard guitar cord, has two wires wrapped inside the outer, protective sheath. One wire carries the signal and the other is the ground. In addition to providing a critical part of the audio circuit, this ground wire can also be used to shield the signal wire from such noise as radio frequency (RF) interference and hum induced by stage lights and neon bar signs. Typically, the signal wire runs through the middle of the cable; the ground wire may be twisted around the signal wire or surround it as a braided shield. But because the cable itself can act as an antenna, this noise-reducing scheme is only effective up to about 25 feet ... at most. One reason to send a high-Z guitar signal into a DI box is to ensure the guitar’s sound survives the long cable runs typically found in stage and studio setups. Enter the balanced cable, which has three wires inside the protective sheath: two carry the signal and one is the ground. In a balanced system, the signal is carried on wires that are intentionally out of phase with each other. When these out-of-phase signals reach their destination, they’re put back in phase and that’s what we hear. At this point, any distortion or noise the signal wires have accumulated will now be out of phase with itself and thus be cancelled out. Called common mode rejection, this clever noise cancellation is what allows balanced, low-Z signals to run through cables as long as 1,000 feet with virtually no sonic degradation. In addition to a 1/4" input and a low-Z XLR output, most DIs offer an additional 1/4" “thru” jack that lets you run your signal into a guitar amp onstage. So instead of relying on stage wedge monitors, which often sound harsh or sterile, you can listen to what you’re playing through a familiar rig—one that’s designed to flatter your flattop and give you the specialized tone-shaping and feedback-fighting controls acoustic guitarists need. Because you control your tone and volume onstage, you can bask in a familiar sound wherever you perform while simultaneously sending a low-Z signal to the sound engineer to mix with the vocal mics and other instruments. 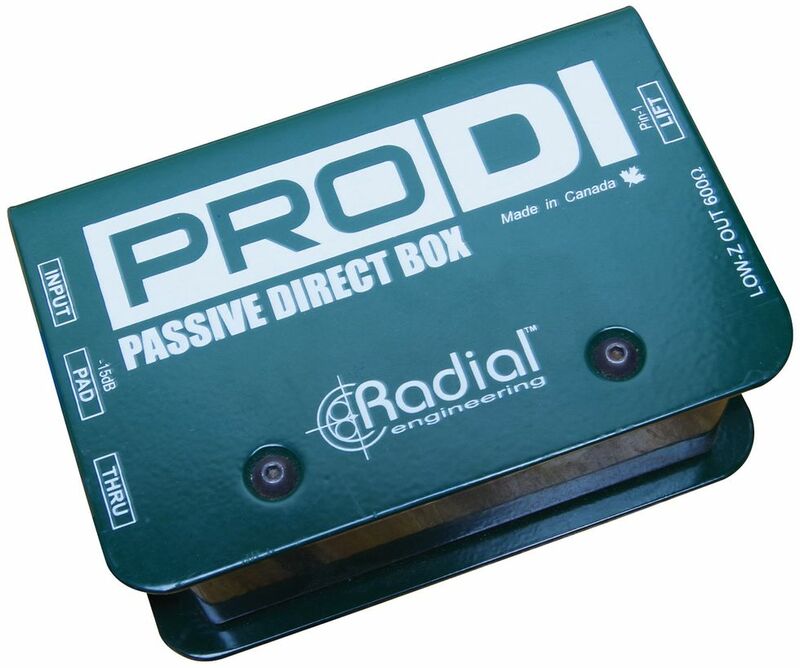 The Radial ProDI ($100 street) is an example of a passive DI box equipped with input, output, and thru jacks. In addition to high-Z-to-low-Z signal conversion, it has a cool trick up its metallic sleeve: a switchable -15 dB pad that lowers the signal at the unit’s input—a lifesaver if your instrument’s output is so hot that it creates clipping. (This is more likely to be an issue with electronic keyboards than an acoustic-electric guitar.) The ProDI also offers a ground-lift switch that can come in handy for breaking hum-causing ground loops. DI boxes have been around since the dawn of pro audio, but as more acoustic guitarists began plugging into sound systems, forward-thinking manufacturers started to take a closer look at what pickers really need when performing at a venue or tracking in a home studio. If your guitar has an onboard preamp, a passive DI box may be enough to get the job done. But companies that specialize in acoustic amplification, such as Fishman and L.R. Baggs, realize that while many guitarists may have soundhole pickups or under-saddle transducers mounted in their axes, they prefer to run these through outboard gear, instead of relying on an onboard preamp that could become outdated in a few years. Why not create a hybrid device that combines a DI and an active preamp with EQ, feedback suppression circuitry, a tuner, and other tools specifically aimed at the acoustic-electric market? Wrapping these tools into a single, convenient package makes sense because it streamlines and simplifies an acoustic guitarist’s rig. Such active DIs, which, depending on their design, get their juice from a 9V battery, an external power supply, or sometimes phantom power from a mixing console, also include many other features that passive DIs lack. Let’s discuss some of them.